Here is another fun photo to share for this #ThrowbackThursday. 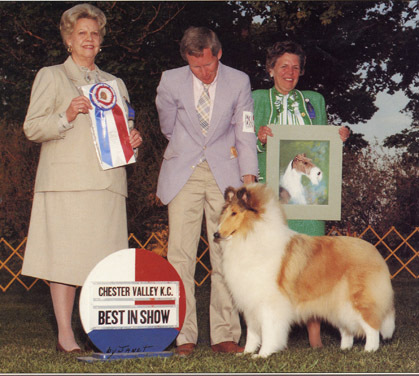 Can you guess the respected AKC judge that is pictured handling a Rough Collie? Can you name the other two ladies in the photo? The correct answer is Mr. Tom Coen handling a collie, judge Mrs. William Kendrick and trophy presenter Mrs. Alan Robson. Posted by chesliepickett on Jan 24 2019. Filed under Featured, The Buzz. You can follow any responses to this entry through the RSS 2.0. Both comments and pings are currently closed.